Symbols are often adopted after a concerted effort by citizens to have a significant item recognized for its importance to the state. To that end, citizens, organizations or school children often research a particular symbol and make a request for a bill. They track the bill through the Legislative process (see “How a Bill Becomes a Law”), often providing further information about their request to the Legislature. In 1889, jeweler Charles Talcott designed our first state seal using an ink bottle, silver dollar and a postage stamp. 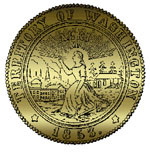 Talcott’s brother, L. Grant Talcott, lettered the words, “The Seal of the State of Washington, 1889,” and another brother, G.N. Talcott, cut the printing die. More information can be found at the Secretary of State site on the State Seal. In 1892, before they had the right to vote, Washington women selected the coast rhododendron as the state flower. They wanted an official flower to enter in a floral exhibit at the 1893 World’s Fair in Chicago. Six flowers were considered, but the final decision was narrowed to clover and the “rhodie,” and voting booths were set up for ladies throughout the state. When the ballots were counted, the rhododendron had been chosen as the Washington state flower. In 1959, the Legislature designated the native species, Rhododendron macrophyllum, as the official flower of the state of Washington. The state flag and the state seal are similar. Passed in 1923, Washington law describes the flag as having dark green bunting with a state seal in the center. In the late 1890s, a blue and gold military state flag with George Washington’s profile on it flew over many cities and towns throughout the state. But when it came to a final decision, the current flag was adopted by the Legislature. According to law, the flag of the United States and the flag of the state shall be prominently installed, displayed and maintained in schools, court rooms and state buildings. For further information about the state flag, check the Secretary of State’s web site. In 1946, an Oregon newspaper teased Washington for not having a state tree. The Portland Oregonian picked out the western hemlock, Tsuga heterophylla for us, but Washington newspapers decided to choose their own and selected the popular western red cedar. State Representative George Adams of Mason County pleaded with the Legislature to adopt the western hemlock. The hemlock, he said, would become “the backbone of this state’s forest industry.” Adams’ bill passed the Legislature and was signed into law in 1947. The goldfinch is a delicate little bird with a yellow body and black wings, and although it eventually became the official state bird, many other birds were considered for the title. In 1928, legislators let school children select the state bird and the meadowlark won hands-down. It was a nice choice but seven other states already had chosen the same bird. Another vote was taken in 1931 by the Washington Federation of Women’s Clubs. Many birds were nominated, but the goldfinch won handily over the tanager, song sparrow, junco and pileated woodpecker. Now there were two state birds and the Legislature decided to leave the final choice to school children. In 1951, children voted for the goldfinch and the Legislature made it unanimous. The state song, “Washington, My Home,” was written by Helen Davis, arranged by Stuart Churchill, and became the official state song in 1959. But, like the goldfinch, it had some stiff competition from another popular song. Back in 1909, “Washington Beloved” was adopted, sort of, by the Legislature. Professor Edmond Meany, the historian, wrote the words and Reginald de Koven, who also wrote “O Promise Me” and other operettas, wrote the music. But the official designation for the song was never formally introduced as a bill and so was not part of the state’s code of law. When a state senator from South Bend introduced a bill in 1959 to make “Washington, My Home” our state song, it was approved unanimously. In April, 2002, the state song was performed at the state Capitol by the Tumwater Girls’ Choir, under the direction of Jack Arend, choir director. The steelhead trout is an anadromous fish, meaning it returns to fresh water rivers to spawn. The scales of the steelhead shine flecks of silver with a gray spotted back from head to tail and an intensely white belly; the two colors separated by a hint of opalescent pink. Steelhead trout is one of the most popular fish for recreational fishing, a major industry in Washington State. The steelhead trout (Salmo gairdnerii) was adopted by the Legislature as a state symbol in 1969. In the early 1940s, the federal Bonneville Power Administration produced a movie encouraging rural residents in the Pacific Northwest to electrify their homes and farms with the power being generated by the newly-built Bonneville and Grand Coulee Dams on the Columbia River. As part of the project, BPA hired folksinger Woody Guthrie at $270 for 30 days to write songs for the movie. Guthrie wrote 26 songs, the most popular of which was “Roll On, Columbia, Roll On,” an ode to the harnessing of Washington’s mightiest river. It was approved as the official Washington state folk song by the Legislature in 1987. Washington is the nation’s top apple-producing state, so it is appropriate that the apple was named a state symbol in 1989, the centennial year. 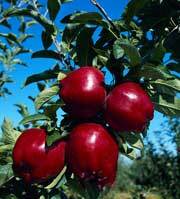 A favorite fruit around the world, the apple comes in many different colors, sizes and varities. From the beautiful blossoms of spring, to the heavily laden branches in autumn, the apple trees of eastern Washington represent one of the largest industries in the state. The Washington apple is certainly one of the most recognized symbols of the state worldwide. Although many state symbols are readily identifiable with the western part of the state, bluebunch wheatgrass is a state symbol that is unique to eastern Washington. Bluebunch wheatgrass was a blessing to Washington’s pioneer farmers and continues to play a major role in our agriculture industry today. 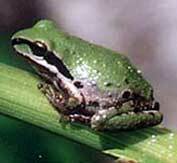 It was adopted by the 1989 Legislature as the official state grass. Its botanical name is Agropyron spicatum. A tartan is a design for the weaving of cloth consisting of perpendicular bands of contrasting colors on a solid background. The Washington State tartan was designed in 1988 by Vancouver, USA Country Dancers Margaret McLeod van Nus and Frank Cannonita to commemorate the Washington State Centennial celebration. It is identified by the background color green, which represents the rich forests of Washington, the “Evergreen State.” The perpendicular bands of contrasting colors represent the following features: blue for the lakes, rivers and ocean; white for the snow-capped mountains; red for the apple and cherry crops; yellow for the wheat and grain crops; and black for the eruption of Mount St. Helens. The bill, designating a state tartan, was signed into law in 1991. The Council of the Scottish Tartans Society also affixed its seal to the official Certificate of Accreditation in 1991. In 1997, the common green darner dragonfly, Anax junius Drury, became Washington’s official state insect after a group of students at Crestwood Elementary School in Kent brought the idea to the Legislature. Students from over 100 school districts statewide participated in the selection of the common green darner dragonfly. Also known as the “mosquito hawk,” this insect can be found throughout Washington and is a beneficial contributor to the ecosystem because it consumes a large number of insect pests. It is easily recognizable by its bright green head and thorax, it has a four to six-inch wingspan and can fly 25 to 35 miles per hour. There are over 400 different species of dragonflies. Dragonflies existed prior to the dinosaur age and some had up to a three-foot wing span. “Darner” is one family of dragonflies and the common green (Anax junius) was first sighted and recorded by Drury in 1773. A reproduction sailing ship of the original Washington/Lady Washington that sailed during approximately 1750-1798, the vessel type is a “brig,” indicating the configuration of the sails. In 2009, the Olympic marmot, the only endemic mammal in Washington state, was designated as the state endemic mammal. The Olympic Marmot inhabits the Olympic Peninsula in the western section of Washington. Olympic Marmots are highly social animals and may live in groups of over a dozen animals. Gregarious bonds are made between animals in a family. Olympic Marmots identify each other by touching noses and smelling cheeks. Olympic Marmots hibernate from September to May. During the morning and afternoon on summer days, they feed and spend their time sunbathing on rocks. In the evening, they return to their burrows. Olympic Marmots are relatively easy to see during the summer months along Hurricane Ridge in the Olympic National Park. On November 11, 1889, Washington became the 42nd state to enter the Union. It is the only state in the Union that is named for a president. Washington was nicknamed “The Evergreen State” by C.T. Conover, pioneer Seattle realtor and historian, for its abundant evergreen forests. The nickname has never been officially adopted.